Fill a large pot of water and bring to a boil. Make sure you salt the water well so the pasta gets a bit of flavor. I usually add 2-3 tsp. Boil pasta according to package directions. Before you drain the noodles, scoop a few cups of the pasta water out and set aside (see item 4). Drain the remaining water and noodles, quickly rinse noodles with cold water, and set aside. Meanwhile heat a 4 quart braiser or skillet over medium heat. Add in 1 tbsp of the olive oil and then add in all the onions. 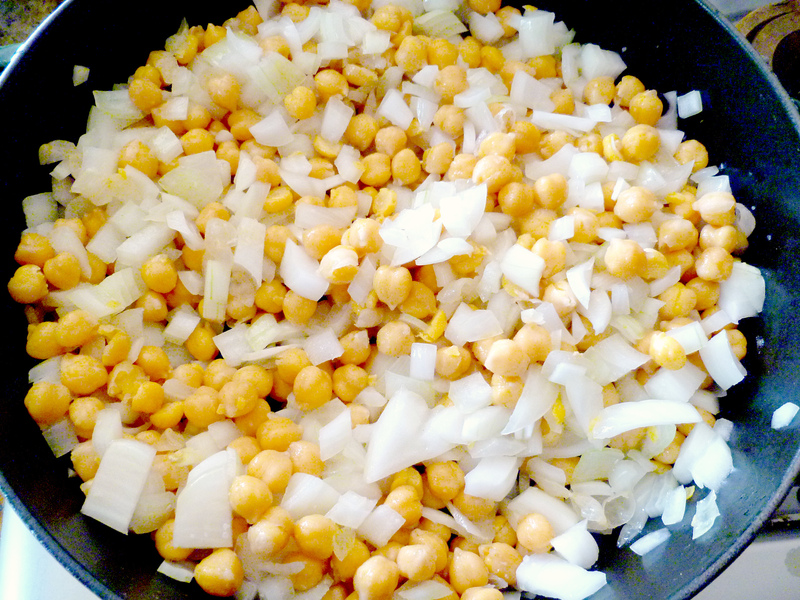 Sprinkle a little kosher salt and saute for about 5 minutes then add in all the chickpeas. Saute for another 10 minutes or so, turning down the heat if necessary. It’s okay to get a little carmelization going and it will actually add some nice flavor. But you don’t want anything to burn. I use a enameled cast iron braiser so it’s almost impossible to burn anything, but if you need to, add in a tbsp or two of water, preferably from the reserved pasta water. Add in HALF the garlic and cook for another 2-3 minutes. Empty the entire contents of the pan into a large bowl and set aside. You should have some browning on the bottom of your pan. Return the pan to the stove and ladle in a scoop or two of the pasta water (you want just enough to cover the bottom of the pan) and scrape any browned bits from the bottom. 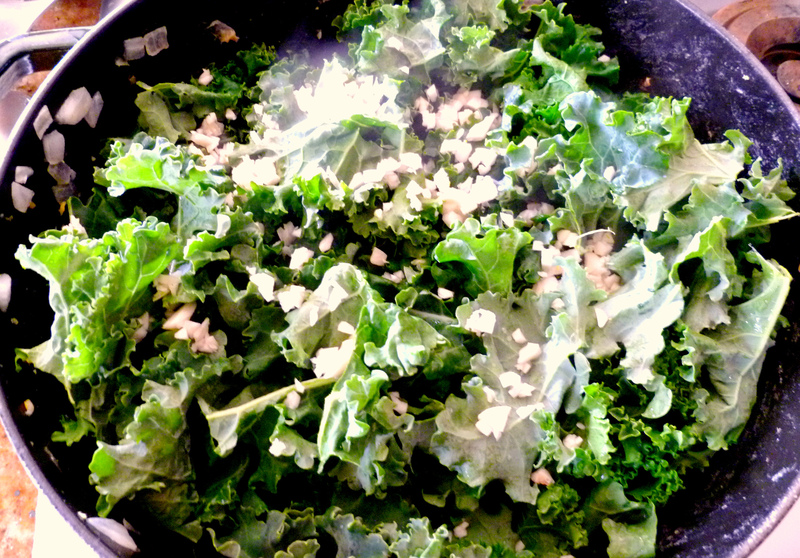 Add in the kale, a pinch or two of kosher salt, lemon juice, the other tbsp of olive oil and the rest of the chopped garlic. Cover and let steam for a few minutes, checking and stirring periodically. If you need more water, add a little more in. You don’t need a bunch of water, just a little skimming the bottom is usually enough. When kale is mostly reduced down to your liking (usually about 7-10 minutes), push the kale to one side of the pan and add in the roasted red peppers to the other side. Using your spatuala, cut any that are too big to bite size pieces. Cover and let warm for about 2 minutes. When the red peppers are warmed through, mix it up with the kale then add in all the contents from the bean and onion bowl. Mix well and let it heat through then cover and turn off heat. Divide noodles into 6 portions on individual plates. Place 1 tsp Earth Balance butter and 2 tsp of Parmesan on top and let the butter melt (if your noodles are too cold, you can quickly microwave them for about 30-60 seconds with the butter and parm on top). Add 1/6 of the bean, onion and kale mixture. Sprinkle with a little more Parmesan if desired and serve. Footnotes: I have recently discovered a beautiful lemon infused extra virgin olive oil that I am in total infatuation with. It’s got a light lemony undertone that is absolutely perfect for dressings and Mediterranean dishes. I use it in this recipe but if you don’t have any, regular extra virgin olive oil will do just fine. I found mine at a little oil and vinegar tasting room in Cannon Beach, Oregon. If you want to try it, I’d highly recommend you give Shelley Crane, the owner, a call to order some (541-961-1294). Any bottle of olive oil or 18 year aged balsamic vinegar is $18 per bottle but it’s so worth it! She can ship 6 bottles of any oil or vinegar for $12. If you order it, you should also order the pomegranate balsamic vinegar. These two items together make the perfect dressing with literally nothing else but a little kosher salt. It’s now my favorite and most easy dressing to make! I can’t get enough of either of these products. Other favorites there are the oregano infused olive oil and the chili pepper olive oil. Yum! I urge you to NOT use canned chickpeas here. In fact, I’ll go out on a limb and tell you if you’re going to use canned, just don’t make this recipe. Yes, you can notice a difference! I’m one of those folks who hear people say this and I just don’t taste the difference, but in this dish, the taste is tremendously noticeable. Canned chickpeas lose that naturally buttery flavor that dried chickpeas have. When you soak and cook dried chickpeas, they have this incredible buttery flavor and it contributes to this dish greatly being there is no real sauce to it. Just put a little forethought to this dish, and make sure you soak some overnight. When you boil them the next day you can pop them in the fridge to use when you are ready. If you get too many, just roast them for a yummy snack. There are TONS of roasted chickpea recipes that you can find all over the internet. I never chop garlic. I have this wonderful little mincer and that is what I use for everything. However, in this recipe, you MUST chop the garlic. Mincing with a garlic mincer is not allowed! Mincing will bring out all the oils in the garlic and it will overpower the dish. Just take a little extra time to finely chop it up but DON”T turn it into a paste so as to get the oils out. As is, if you use 3 cups of chickpeas in this recipe, your total calories per serving are 526 with 15 grams of protein. Want to cut out 200 calories per serving? Just eliminate the pasta and eat this as a bean and kale salad. It would be just as delicious that way. I found myself scooping out the contents and eating it right out of the pan. 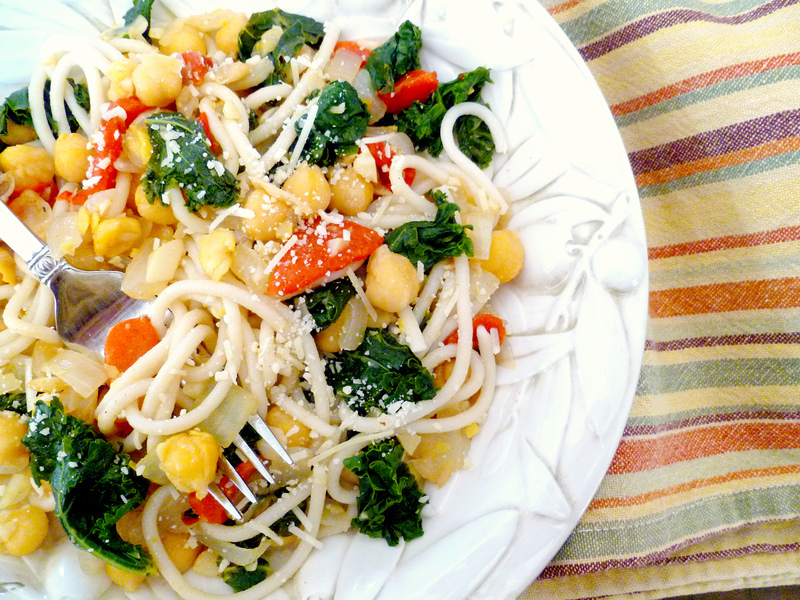 You can also use just half the pasta (1 oz instead of 2 oz per serving) to cut out 100 calories. That way you get your pasta kick without the extra calories. That would bring the protein factor to 13 grams instead of 15 as well. Saute the onions, beans and half the garlic with a few pinches of kosher salt for 10-15 minutes. 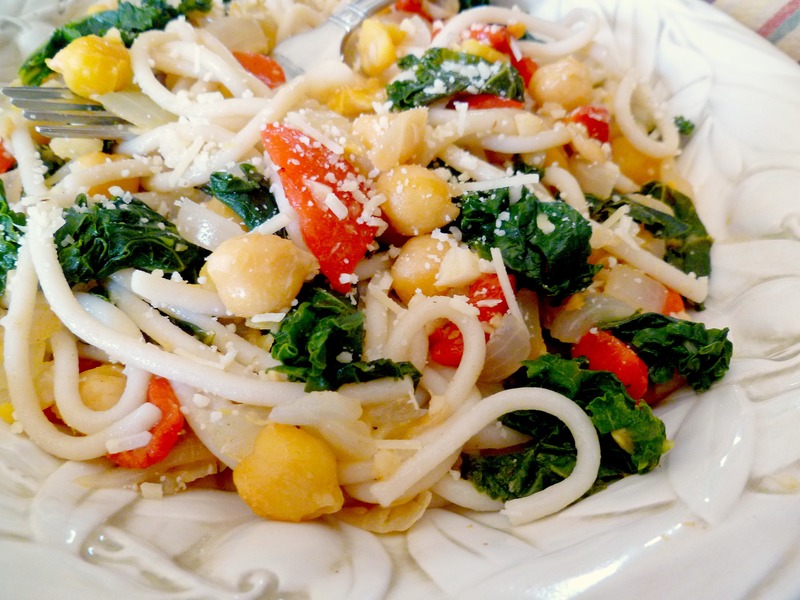 Remove the chickpeas and onions from the pan and add in the little bit of reserved pasta water, kale, lemon juice, half the garlic and kosher salt. 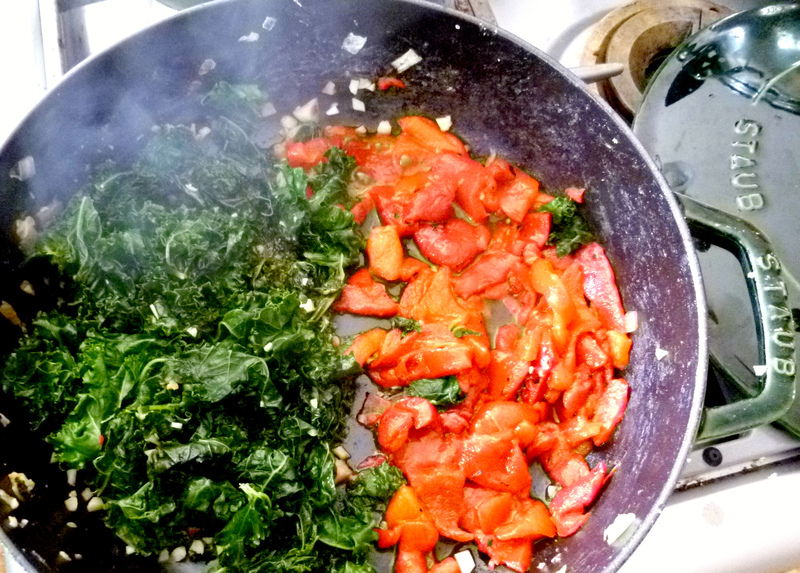 Once the kale is reduced down, push it to one side of the pan and add the drained roasted red peppers to the other side. With your spatula, cut the peppers to bite size pieces. Mix the beans mixture back into the pan with the kale and peppers. Divide the pasta into 6 portions, add 1 tsp earth balance and 2 tsp vegan parm on top. Put in microwave for 30-60 seconds if needed then add the bean and kale mixture on top. Add a bit more Parmesan if desired and serve. This dish looks so fresh and vibrant. I’ll take your advice on the chickpeas and resort to using only the fresh kind. I know the recipe is good when the creator is particular with the ingredients. Thanks for sharing! Thank you! It really is a vibrant, tasty dish. I was rather surprised because I wasn’t sure how well this would turn out without a real sauciness to it. I’m a real flavor hound and usually sauce-less dishes end up in the garbage at my house. This one though, is packed with flavor and tastes so fresh. Enjoy! I’m sure I will. Thanks again. I often do “non-sauce” pasta dishes and generally enjoy them quite a lot. Beans consistently work really well in them, and I’d bet white beans (navy/white kidney/cannelini) could sub in here nicely. What else… oh! I bought some Sicilian lemon white balsamic vinegar in a little shop in Boston and found that a drizzle of it dressed up many pasta dishes very nicely. Instead of the shot of vermouth or squeeze of lemon juice, basically. Don’t remember the shop name, but there are two of them on Newbury street. Oh boy, that lemon white balsamic vinegar sounds heavenly! I bet it adds a nice acidic yet slightly sweet taste to pasta and dressings… that would be right up my alley. I’ll have to see if I can find something similar here in Seattle. And yes, I bet the beans you mentioned would go wonderful here. 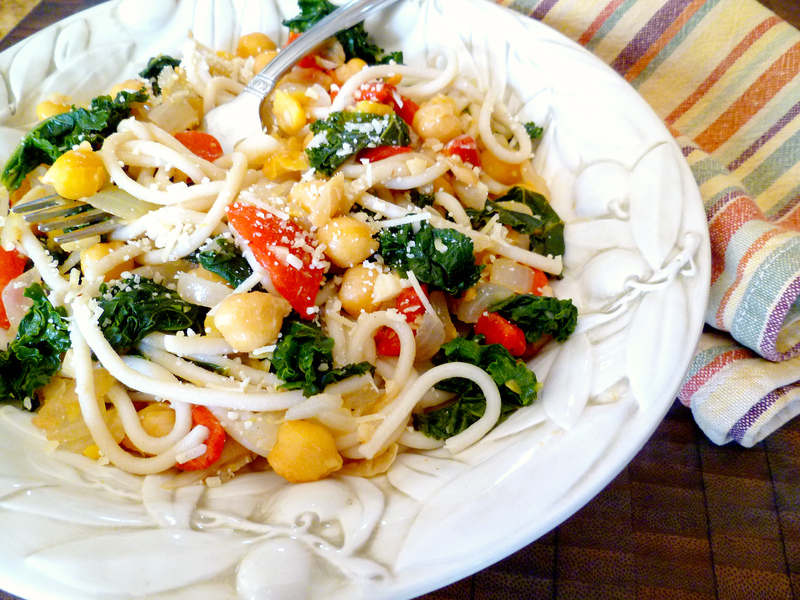 I am a little biased towards chickpeas only because they have that wonderful buttery taste which really compliments the flavors of this dish, but white beans sound great! Go for it! 🙂 You might get more oils out that way so you may want to lower the amount of garlic. When I mince my garlic versus chopping it, I get two very different taste results. The garlic taste is much more refined when chopped than minced. That is so interesting, I never thought about that! I do know that when I make Thai food I have to pound my garlic and chiles in a mortar & pestle to get the right flavor, though, so it sure makes sense. Hey, are you going to the BlogHer Food Conference in Seattle in June? I actually didn’t hear about it. What day in June is it? Do you have a link to it? Enjoying your site so I’m nominating you for the Illuminating Blogger Award for informative, illuminating blog content. I know not everyone participates in blog awards but I hope you’ll at least check it out because it’s a great way to discover new blogs and meet new web friends. If you’re interested in participating, you can check out the details at my site …http://foodstoriesblog.com/illuminating-blogger-award/ … Either way, hope you’re having a great day!